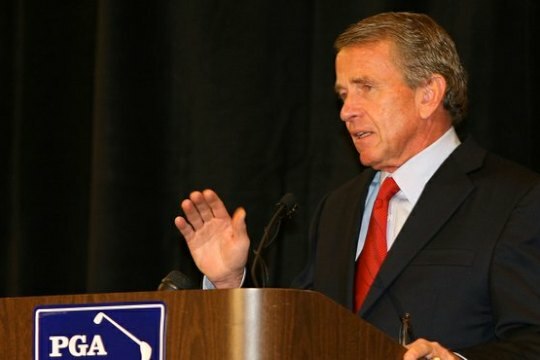 PGA Tour Commissioner, Tim Finchem declared the Tour is not ‘at war’ with golf’s ruling bodies in disagreeing with the proposed anchoring ban of the belly or long-handled putters. “We (PGA Tour) did give the USGA our position last week and our Player Advisory Council concluded that we should be opposed to it and we articulated that to the USGA,” said Finchem. “But we were asked our opinion and feel strongly going down that road would be a mistake. “Our view is that if there is one thing that would prevail across a lot of players and a lot of our board members is that it’s been around for a generation and the game of golf has done quite well. And if golf’s ruling bodies should decide to introduce an across the board ban, then Finchem was quizzed if the PGA Tour will go it alone in conducting a Tour that allows for the anchoring of the belly or long-handled putter. “It may get a little chaotic but first of all our rules say we are going to follow the USGA rules provided we maintain the right to differ,” said Finchem. “But this is just one rule and we are not interested in getting into the rule-making business. We like the structure for rules. We are delighted this rule has got the transparency it has and everyone has been invited to give an opinion whether it’s an equipment matter or not and that’s good. “But if the ban is put in place we would have go back to our Board and begin the process again, so lets just see what happens as I would not like to speculate right now except to say ideally that all the rules should be under the one roof and all the rules should be the same for everybody.